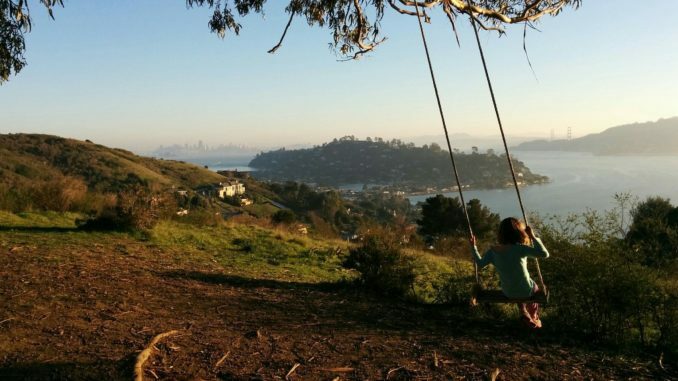 Tucked away and hidden aside a residential neighborhood atop the hills of Tiburon, an off the radar slice of heaven, known by locals as the Hippie Tree, is easily one of the best views in the bay area. Only 30 minutes from downtown San Francisco, it is the perfect spot to have a picnic, read a book, or watch the sunset, all without the crowds of most other San Francisco tourist destinations. It could also be a great complement to a day in Sausalito or Muir Woods. Simply follow the 101 North across the Golden Gate Bridge until you reach Tiburon Blvd. Head East a couple of miles and take a left on Gilmartin Drive. Drive up to road until you come to a steep bend where a final home is located on the right. Meanwhile, be on the lookout to the left for a fire road entrance with a couple of signs. Park anywhere nearby that is available. Another option would be to take your bike on the ferry from San Francisco to the Tiburon Terminal. From there, it should only take a few minutes to bike North on Tiburon Blvd to Gilmartin Drive. Once you have parked, it is less than a five minute walk up the dirt path to the massive Eucalyptus tree, which looms large on the hill, providing significant amounts of shade and the strength to hold up a perfectly positioned swing. You can enjoy the views while rocking back and forth, on the fertile ground, or even perched atop a rocky area to the right where you might see children climbing. The whole area around the tree is very open with nothing but grass and shrubbery, so your view will not be impeded at all. It is up to you if you want to catch some rays or cool down beneath the branches. On a typical weekend, expect less than ten people hanging out at any one time, and on weekdays you may even find yourself alone. On a clear day, the views of the San Francisco skyline and Golden Gate Bridge are remarkable. You can even see the Bay Bridge in the distance far to your left. To the right you will find Richarson Bay with a handful of sail boats and Mt. Tamalpais as the backdrop. The hint of Eucalyptus in the air makes the views just that much better. Regardless if you are driving or taking the ferry back to the city, a popular spot to grab a bite in Tiburon is Sam’s Anchor Cafe, which is located near the Ferry Terminal. Prepare yourself for more great views of the bay on their outdoor patio and enjoy some fresh seafood. You could even stop by Sam’s beforehand and take something to go up to the tree with you. It is easy to spend hours at the Hippie Tree as the view really never gets old. However, a visit at sunset is absolutely breathtaking. Make sure you don’t pass up on this wonderful destination during your next trip to San Francisco. Only 25 miles further up the coast lies a secluded beach destination, only accessible via hiking trail. You will most certainly find more people here than at the Hippie Tree, but not to the point where it will ruin your experience. Due to the fact that the hike is 1.5-2 hours each direction, this is not a location where you can easily show up unplanned last minute. After passing by Muir Woods, you will come up upon Stinson Beach. Follow the coast through Bolinas until you reach a long dirt road. It will appear that you are going to the middle of nowhere, which is spot on. After a few minutes, the road will suddenly in a parking lot. The Palomarin trailhead begins promptly at this location. Unfortunately, as you make your way down the trail, you will feel as if you are being misguided by the directional signs. These will take you to other destinations via smaller trails. For whatever reason, nothing says “Alamere Falls”, almost as if someone really is trying to hide it. So, make sure you stay on the main trail that is lined with eucalyptus trees, streams, and ponds until you finally reach a small sign, stationed on your left. Not only is this sign very easy to miss, but the upcoming small spur trail that leads from this main Coast Trail to the falls is unmaintained, almost feeling as if you are walking through a jungle. This tight trail takes you about a half mile to a couple of small cascading falls that eventually dump over the edge of a 100 foot cliff, right onto the beach, and into the Pacific Ocean. The view to the North and to the South down the coast from atop the cliff is already special in itself, but it is also fairly easy to position yourself where the water drops to take in that perspective. For the more climbing inclined, it is possible to make your way down to Wildcat beach. On the North side of the waterfall can be found a section of the cliff that has been transformed into somewhat of a climbing path. Be careful, as it is very easy to lose footing and/or hand grip since the rock is so crumbly and unstable. Once you have reached the beach, you have a whole new take on the waterfall from below. Depending on the time of the year, the water can really be rushing over in full force. One of the coolest aspects of this waterfall over others is that it carves out a hole in the beach, creating its own little river flowing into the ocean. You may find that some people will be spending the majority of their day on the beach, whereas others might only be interested in rummaging around the waterfall for 30 minutes and heading back. Just make sure that you don’t wear yourself out too much because not only will you have to climb up the cliffside, but hike all the way back to your car. If you get the feeling that Alamere Falls may be a little too far out of the way for you, then consider yet another hidden venue deep within Muir Woods. In order to reach it, you can quite simply go ahead and follow the hairpins down into the valley to the Muir Woods main parking area. However, instead of heading down, it is preferable to park up above the valley on the Panoramic Highway where it is typically much less crowded. This is the road that follows the ridge all around Muir Woods. Depending on exactly how far down the road you park, it should be about 15-30 minutes of hiking down the Redwood Trail until you reach the Tourist Club. The Tourist Club is a German alpine lodge, lofted up on the side of the hill overlooking the Muir Woods Valley. Once again, this place stays fairly hidden for a reason, so you will not be seeing any marked signs. If you are not paying attention, you might walk right past the establishment thinking it is something else, but once you enter its doors, it will be hard to imagine otherwise. The Tourist Club is actually a very prestigious club, and it takes a lot of work to join. They do not open their gates to the public year round. They even used to have a monthly event for the public but have now limited that to 3 parties per year, Maifest, Sommerfest, and Kinderfest. These gatherings involve German music and dancing, games, food, and of course beer. Just outside of the retreat you will even find a rope swing that takes you flying out into the valley. However, simply hanging out in the middle of the woods is really the most magical aspect of your stay. Every event is first come first serve, including seating preference, so prepare to arrive early to claim your spot. Although the Tourist Club is closer than Alamere Falls, you will either have to be very lucky, or plan your visit around one of their festivals. It is unfortunate that the doors are not open more often, but the club takes pride in what they have, and as much as they love to share it, they like having it all to themselves whenever possible. The only downfall of their location is that once you’ve had your fill on fun, food and beer, you need to make the trek back up to your car. Then again, it would not be nearly the same memorable experience without all of the extra effort getting there and back.